The best $1,000 bucks I have every spent! I just got my bar results and I passed. Just wanted to say “thank you.” I am an attorney taker and could not have done it (after 25 years!) without your Bar Exam Cram Session Course! Thank you for all that you do for California attorney’s to be! 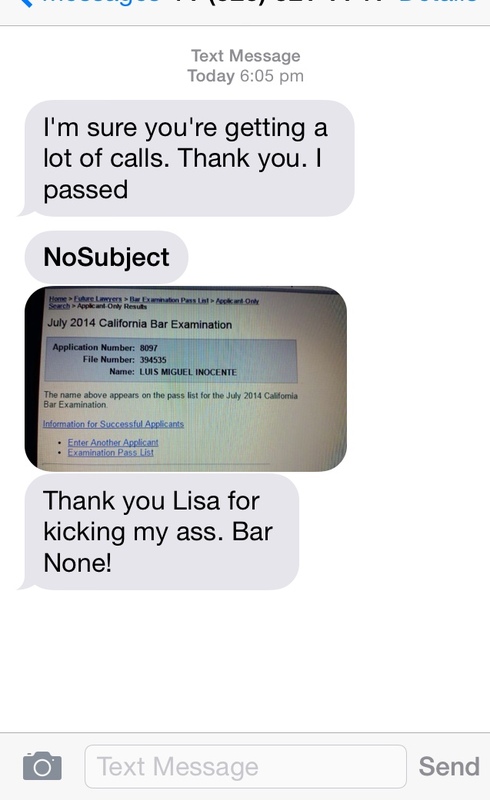 I am so excited to share with you and your staff the great news: I passed the February 2015 bar exam! I stumbled onto your blog during the July 2014 bar round, and on a whim I registered for blog updates. I then forgot all about it. I was crushed in November when my name didn’t appear on the pass list. I didn’t know what to do, but I set my sights on the February 2015 exam anyway. In early February I knew I wasn’t where I should be to have a successful exam. With about 20 days left until the exam, I received an e-mail from your blog. I found out that you had an “11th hour” 2-day cram session available that coming weekend. I was skeptical. What could you offer that two previous bar prep companies hadn’t already? But I signed up because I knew that I needed to give this round my everything so that I would never have to take this exam again. Impulse buys aren’t always good ideas. However, and without exaggeration, your weekend session delivered every single stated goal. Your staff, the setting and your instruction were perfect. I genuinely felt like I submitted a questionnaire detailing my “struggle spots” and in response you crafted a substantive review just for me. You are an incredible teacher. Thank you so much for your care and dedication. I truly walked away from that weekend filled with hope – a hope that carried me through those final study days, and ultimately led to a successful exam. I will (and have already!) emphatically refer anyone taking the bar exam to you. Honestly I do not know where to begin. I have dreamt of this day for a while now. When I put my information in yesterday evening and saw that magic phrase, “the name above matches a name on the pass list,” only one thing came to mind; LISA!!! If it wasn’t for you, I would not be sitting here today. Law school came very easy to me and gave be a very big head. The first time around taking Barbri was difficult, frustrating, and over whelming. Passed! Passed! Passed! Lisa, your program is proof that you can work full time and take care of a child AND pass the California! Your program is ideal for the person who is willing to wrk hard for a few months, but has a full agenda and can only manage to take a week or two off before the bar. If I would’ve taken you the first time, I would not have had to retake it! You said would pass. Your essay approach is better than any video lecture I have ever watched. Your Bar Exam Templates ROCK! I would be happy to share my experience with any of your future lawyer students!